Most brides hope their gown will fit, and at least reflect their style in some way. But for brides looking for a dress that truly reflects who they are as a person? That’s a tall order. 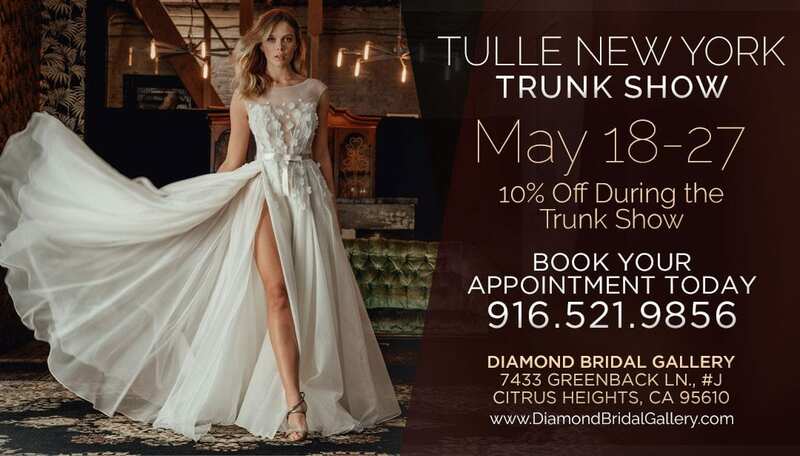 One which might be answered at the Tulle New York Trunk show this May at Diamond Bridal Gallery. Some of the most brilliant bridal fashions start from very small, even strange inspirations. That’s the case for Antonio, the designer behind the gorgeous Tulle New York bridal and couture collection. Born in Havana, Cuba, Antonia became excited about designing gowns at a very young age. His first project? A gown made of toilet paper for a Barbie doll. “Excitement, joy, and delight” that he felt that day guides him even now, as he considers every dress a reflection of a bride’s inner being, and an opportunity to bring unprecedented beauty and pleasure. Both the Antonia Gulle and Jennifer Black lines of the collection embody that joy, with personalized detail for the most unique brides. Satin and silk reign supreme with clean, modern designs featuring stunning necklines, clover leaf trains, architectural seaming, and crochet net bell sleeves. All gowns have an old-world meets modern vibe, and are stunning choices in an industry crowded with elaborate, and sometimes, overdone designs. For a taste of this unique collection, book your place: the trunk show runs from May 18th through the 27th.